The last of winter’s candied citrus peel waits to be chopped for Easter week Hot Cross Buns. Do these round buns crossed into four quadrants represent the Saxon rite of spring with the four phases of the moon, or the four elements of earth, air, fire and water? Did early Christian monks fold this primeval cake into their own mystique, taking the symbol as the sign of the Cross? 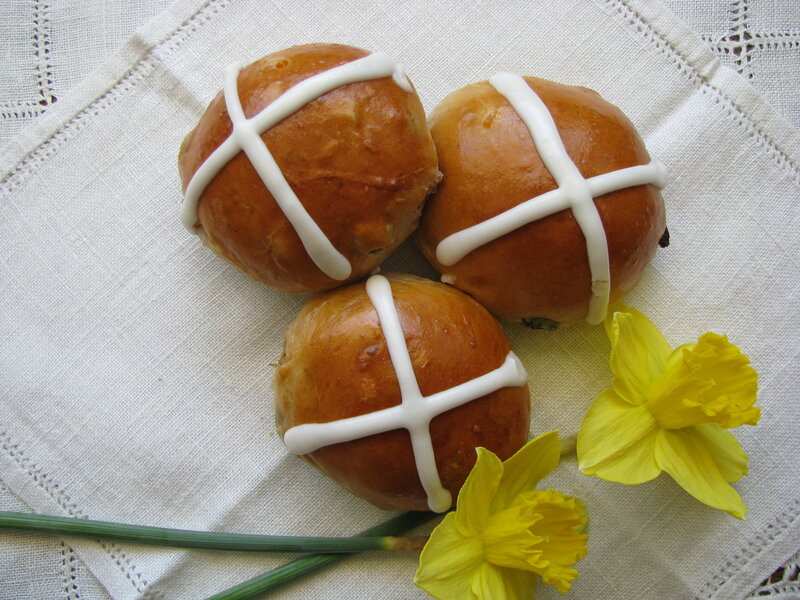 Did a fourteenth century cleric distribute spiced, crossed buns to the poor on Good Friday? And who wrote: “If you have no daughters, / Give them to your sons / One a penny, two a penny / Hot Cross Buns”? These seasonal baked goods have been with us longer than we can reckon. From the tradition I know best, the recipe includes a sugar and butter enriched fermented dough, dried fruits representing the summer harvest to come, spices for richness and celebration— baked together in token loaves for holiday sharing. Hot Cross Buns traditionally eaten on Good Friday or Easter Sunday grace my table each year. No bakery offers anything comparable to homemade buns. If you have a stand mixer with a dough hook, the task is simple. Your only two pointers to remember are: 1) The softest dough makes the lightest buns. 2) The yeast needs plenty of time to rise. Otherwise it’s simply a matter of measure, stir, mix, shape, glaze and bake—bringing you one of time’s treasured delights. Sprinkle yeast and ginger over warm milk in mixing bowl. Give yeast a few minutes to dissolve and sponge. Add sugar, eggs, salt, spices and whisk together. Add bread flour; stir to combine and allow to rest 10–15 minutes for flour to absorb moisture. Knead dough using dough hook on standing electric mixer, or scrape dough onto lightly floured flat surface and knead by hand. Resist temptation to add any more than very little additional flour. Knead for 3–4 minutes; then work in soft butter 2 tablespoons at a time. Continue kneading for total of 10 minutes. Dough now should be soft and silky. Cover and allow dough to rest 10–20 minutes. Work in fruit until evenly distributed. Place dough in mixing bowl, cover and allow to rise in warm place until double in volume. Punch down dough and scrape out onto lightly floured flat surface. Using dough cutter or long knife, cut patted-out dough into 15–16 even lumps. Each piece will weigh about 2 1/2 oz. Shape each lump into a nice, round bun and place on lightly greased or parchment-lined baking sheet. Cover with tea towel and allow buns to rise until double in size. Preheat oven to 350°F. Brush buns with egg wash (a beaten whole egg) and bake 20 minutes or until golden brown. To make crosses let buns cool, then pipe or drip a white icing* cross over each bun. Makes l6. Hot Cross Buns freeze well. *3 oz. powdered sugar (3/4 cup) mixed with 1 ½ tablespoons milk. 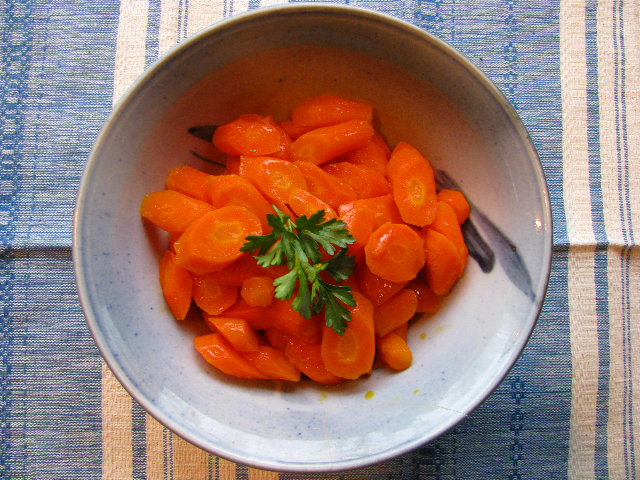 You are currently browsing the Mary Jo's Kitchen blog archives for April, 2011.